Thailand’s finance minister expressed concern about a weak currency and damage to the economy on Friday as supporters and opponents of the government prepared for big rallies this month that risk pushing the divided country to the brink of chaos. Planned infrastructure projects worth $65 billion intended to boost an economy blighted by political tension and sagging exports would be postponed until the end of the year, Kittirat Na Ranong said, while the baht’s slide against the US dollar could hurt imports and raise energy prices. Protesters intent on toppling prime minister Yingluck Shinawatra’s government want to suspend Thailand’s fragile democracy by thwarting a February election and installing a “people’s council” to reform the political system. 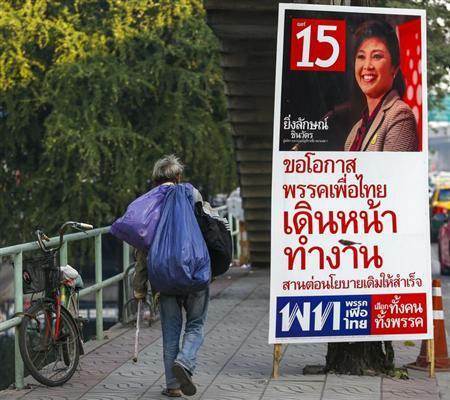 They are planning a “shutdown” of Bangkok from January 13, deepening uncertainty about a poll Yingluck’s Puea Thai Party would otherwise be almost certain to win. Protesters have yet to reveal exactly what they will target, or for how long. The crisis is similar to previous years, with the country polarised over the political dominance of Yingluck’s brother and former premier, Thaksin Shinawatra, 64, who lives in self-imposed exile to avoid a jail sentence. 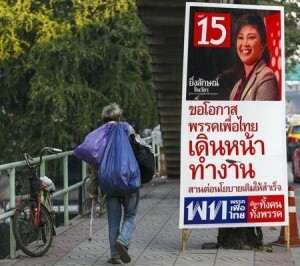 Many of Bangkok’s middle classes, old-money elites and royalists are angered by the influence of a man they say is a corrupt crony capitalist who manipulated the poor with giveaways designed to win votes and entrench the power of his billionaire family and business friends. However, millions of poor in the north and northeast who benefited from cheap healthcare, micro-loans and generous subsidies hail Thaksin as a hero and are willing to take to the streets to defend his governments. Those supporters, better known as the “red shirts”, held mass rallies in support of Thaksin in 2010, which ended with the deaths of more than 90 people in military offensives to retake occupied sites in Bangkok. The red shirts, who were instrumental in bringing Yingluck to power in 2011, announced on Friday they would enter the fray by holding rallies of their own outside the capital to protect democracy and counter those staged by the anti-government group. “Red shirts will gather across the country to show the world who are the owners of sovereignty,” said one of their leaders, Nattawut Saikuar, who is also deputy commerce minister. The prospect of rival groups gathering in large numbers does not bode well for Thailand and risks intensifying a crisis that in recent weeks has seen sporadic bouts of violence, including clashes between demonstrators and riot police and several deadly shootings by mystery gunmen. Anti-government demonstrators plan to march through Bangkok daily starting from Sunday in a bid to re-energise supporters after the end of the year break, before which more than 200,000 had rallied peacefully in the capital. Political concerns have had an impact on markets and the currency, mainly due to worries that the February 2 election called by Yingluck to reduce tensions would have the opposite effect. Bearish bets on the Thai baht are at their highest in nearly two years as the political crisis escalates, according to a Reuters poll released on Friday. The baht slid to 32.98 per dollar on Friday, its weakest since February 2010. The benchmark stock index closed down 0.5 percent at 1,224.62 on Friday, with investors selling major stocks. Earlier it hit 1,208.60, the lowest since August 2012, and has lost 15 percent since the start of November. Any postponement to the poll, which the Election Commission has asked for, could seriously impact policymaking and expose the government to more attacks and the possibility of military or judicial intervention, analysts say. Yingluck refuses to cave in and says a change of the poll date would be unconstitutional. The crisis seemed unlikely only a few months ago, when Thaksin’s opponents appeared to be tolerating Yingluck’s government. Her Puea Thai party tried to force through an amnesty bill that would have nullified Thaksin’s conviction, sparking the latest round of protests.